As has been evident to independently minded observers for a long time, as I have repeatedly pointed out for several years in my blog on-line, Sathya Sai Baba has been degenerating since soon after his botched hip-joint replacement in 2003. It became almost impossible not to notice - at least since the 85th birthday - that Sathya Sai Baba appeared almost like a wooden idol, and he looked as if he was sedated then. Never a smile crossed his face - he who claimed he always kept a smiling face and berated those with 'castor oil' faces'! That he broke down and cried in public on his birthday (see brief video) - an act he has always called weakness - rather underlined the point that he was in depression rather than anything approaching his former self. Now some of the facts of the matter are already emerging. His close boyfriend and roommate Satyajit allegedly administered an unknown number of sleeping pills and sedatives to him over a long period, some have said six months, and he was reportedly in full control of Sai Baba, his food and anyone who could get near to him. Apparently, the love Sai Baba practised had its own special prison! Devotees may indeed wonder how their omnipotent Lord and God Creator of the Universe could also get into such a terrible 'fix' of drug dependency, mental and emotional degeneration and virtual imprisonment in the agendas of his minders (he reportedly cried out for help when they took him away to his own super-specialty hospital!). Late Satya Sai Baba’s trusted follower of 15 years, Yatish Salian alias Satyajit was sidelined by the 8 members Central Trust: As Sai Baba's closest boyfriend and roommate since his early years (he was 33 years old in 2011), Satyajit was in charge of the funeral and all involved (including the Prime Minister, the President and countless other 'dignitaries' who must face the indignity and loss of face which accrues to them of being the guests of Sai Baba's last paramour). Satyajit claimed Sathya Sai Baba's last will and testamen tleft the entire Sathya Sai Central Trust responsibilities to him! It was widely reported that "Satyajit is demanding his full share in the trust". Further, the authorities reportedly already agreed that he should take over the Sai ashrams - together with Sai Baba's brothers' son Ratnakar. Who would want to donate or visit then?There may still have remained enough deceived and deluded persons who had invested everything of themselves in Sathya Sai Baba to fill the Poornachandra Hall many times over. Some people never can learn, it is too late and too crushingly disastrous to their 'well-being'. Besides, embezzlement within the clandestine unaccountable trust was clearly a simple matter, as those once after many years dismissed from the board for that by Sai Baba had discovered (including the most corrupt engineer Colonel Joga Rao). Sai Baba said in 1960 he would live for 59 more years and again in 1961 he would live for 58 more years. Do the arithmetic and see that even lunar years will not solve his wrongly predicted remaining number of years made when he was nearly 40 years old! One should ask, why would Sathya Sai Baba have a young boy attending on him day in and day out? It takes little perspicacity to realize, on the background of the many reports, including signed testimonies and affidavits, that Sathya Sai Baba was a major sexual abuser and It is almost undeniable to non-worshipping observers, that Sai Baba must himself have been sexually abused since childhood, one may wonder by whom? (See Health Professional Comes Out On BBC: Sai Baba sexually abused him when young) It has long been reported by ex-students that the rector of the Sai school in Puttparti, Ms. Munni Kaul (known as 'Munni Auntie') was herself a sexual abuser of children and that she selected suitable boys for Sathya Sai Baba's use from the age of six at least! I was also personally informed of this in 1996 by the friend of parents of a young boy who was abused by her - Mr. V. Ramnath of the IAS (see here). At that time I managed to put it down to 'vicious rumour', but that was when I was still convinced Sai Baba was somehow divine and before the dam of allegations broke and I contacted many of those involved, three of whom I knew well already (though they had not then come to terms with the abuse and did not tell me). 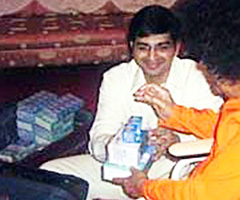 The Economic Times reports Threat to life of Sai Baba's caregiver & personal doctor (26 Apl) HYDERABAD:"With intelligence reports hinting that there was threat to the life of Sathya Sai Baba's caregiver Satyajit and personal doctor Dr Aiyar, the state government on Monday advised both of them to make fewer public appearance for some time. As the report also cautioned that certain elements were trying to eliminate some persons who were close to the Baba, the government beefed up security for all the trust members. Satyajit is a front runner for the top post in the Sathya Sai Central Trust with majority of its members openly expressing their preference for him. Dr Aiyar was criticised by many devotees for not maintaining any medical records of Sai Baba, some of them, even made threat calls to him while Baba was in hospital. This was revealed by Prasanthi Nilayam sources." 1) Two or three students are picked up by swami and asked to follow him while giving darshans. These guys have no knowledge of whats happening in the ashram. They come and do the job. 2) Others like Dileep, Satyajit and Prusthi are of a different kind. They know all that’s going on inside swami’s room,central trust and in the interviews. These guys know of swamis needs and fullfills them out of fear. These guys started out as devotees. Their parents were devotees too. Then they applied to the college and became students and form boys. Their parents got interviews and swami asked them to settle down in the ashram. Then they were given (these) jobs. The boys on the other hand got jobs too and everyone fell into a trap. Now the boys have to do whatever swami/ trustees tell them too. Like hiding lingams in the big hand kercheifs. These boys are torn between loyalty to swami and also feel betrayed by him. They fear for their family name as banishment from ashram means social shame. They are afraid that their parents would be treated badly if they did not behave well. It is very complex situation. Then the last hope they have, that of youth fades away. Now these boys are old and have lost all hope of leaving the ashram. At their age who will give them jobs? Hope gone, hope which actually never existed. Now they will do as told." In 2014, the Sathya Sai Central Trust gave permission for the former closest young male friend of Sathya Sai Baba, Satyajit, to go on a tour of some Sai centres that yet remain in the USA. He relates this – all very haltingly – in a talk he gave in the Boston, Mass., Sai Centre February 16, 2014, (put out on vimeo). The talk was extremely guarded and it contained no information or further insight into Sathya Sai Baba, or into his last invalid years of decline and dependency on sleeping pills and stimulants provided through Satyajit, nor of what happened to him when hospitalised (Satyajit was allowed to the sick-bed) nor the manner of his death, nor his well-known promises to Satyajit to become his successor. The long-term friend and intimate of Sai Baba's family, Eileen Weed, reported:- "
"No doubt, he has been given VERY strict instructions to keep what he knows to himself, or face the consequences. Since his talks are on video, he tightly reigns in his mouth and mind. I wonder if there is any chance, sometime in the future, that he will be able to break away and find his career elsewhere. Only then would we have a chance to know some of the secrets in his mind. There was another boy who was sb’s shadow for years, up until the mid-1980s. When he sung for bhajans, sb would lean forward and stare at him intensely. My ardent devotee friend had told me the force of attraction between the two was so intense that she had to look away in embarrassment, whenever the two of them locked eyes. That other ‘inmate’ of the bedchambers suddenly left to USA for further studies, throwing us all into a confused shock of WHY in the world he would leave GOD himself?? We figured he must have been attracted somehow to the evil, worldly life. We heard reports of how sb was distraught and enraged, and declared he would never step foot in the ashram again. A couple of years later we then heard he had come for a visit, sporting a beard and mustache, but was not permitted into the darshan compound. Nowadays I respect him for breaking away and following his dream, and hope someday he could surface to tell his story!"